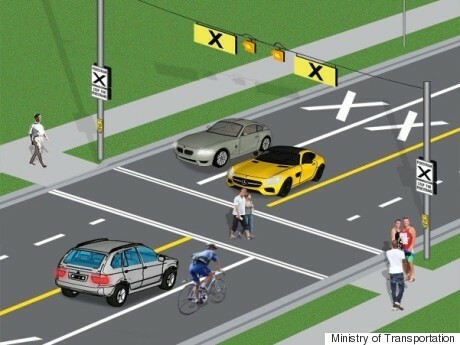 Now make sure you know what a crosswalk is! Last year, Ontario's Ministry of Transportation introduced a series of new laws that included harsher fines for texting and driving, among other behaviours, in its "Making Ontario Roads Safer Act." Now, as of Jan. 1, 2016, those fines include staying put while people cross the street — at least, at particularly demarcated zones. 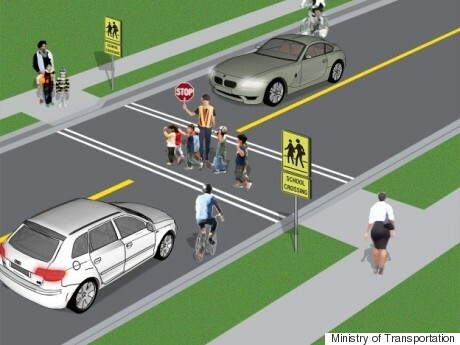 According to the Ministry of Transportation, all drivers (including cyclists) must now stop and yield the whole roadway at pedestrian crossovers, as well as school crossings that have a crossing guard carrying a stop sign. So that means you can't just wait until people have cleared enough space to allow you to zoom through in these areas — you have to wait until they've fully reached the other side. Failure to do so could mean fines from $150 to $500 and three demerit points, or double that in Community Safety Zones, which are marked and found near schools and public areas. Identified by specific signs, pavement markings and lights – illuminated overhead lights/warning signs and pedestrian push buttons. 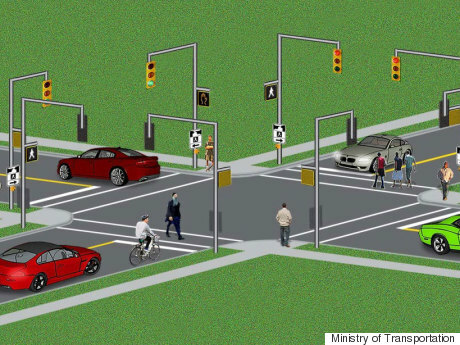 A crossing location usually found at intersections with traffic signals, pedestrian signals or stop signs. Any pedestrian crossing where a school crossing guard is present and displaying a school crossing stop sign. On their website, the Ministry also emphasizes the responsibility of pedestrians in staying safe, including never crossing between parked cars, and always trying to make eye contact with drivers to ensure they see you. For those on their feet, it's also important to note that these new rules don't apply at crosswalks with stop signs and traffic signals.